The first four films in the popular and acclaimed Harry Potter series – Harry Potter and the Sorcerer’s Stone, Harry Potter and the Chamber of Secrets, Harry Potter and the Prisoner of Azkaban, and Harry Potter and the Goblet of Fire – will be available on Ultra HD Blu-ray Combo Pack on November 7th. Harry Potter and the Order of the Phoenix, Harry Potter and the Half-Blood Prince, Harry Potter and the Deathly Hallows – Part 1, and Harry Potter and the Deathly Hallows – Part 2 were released on Ultra HD Blu-ray Combo Pack earlier this year. The eight films (Harry Potter 4K Movie Collection) will also be available for the first time in 4K HDR as a set, in the Harry Potter 8-Film Collection on Ultra HD Blu-ray Combo Pack. 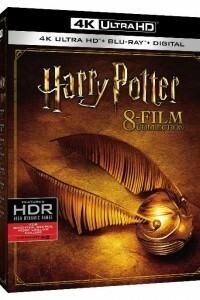 Additionally, the Wizarding World 9-Film Collection, which includes all eight Harry Potter films as well as Fantastic Beasts and Where to Find Them will be available on Blu-ray and DVD. The Ultra HD Blu-ray Combo Packs will include an Ultra HD Blu-ray disc with the feature films in 4K with HDR, a Blu-ray disc with the feature films and special features in HD, and a Digital version of the feature films. Ultra HD Blu-ray showcases 4K resolution with High Dynamic Range (HDR) and a wider color spectrum, offering consumers brighter, deeper, more lifelike colors for a home entertainment viewing experience like never before. For the complete 4K Ultra HD experience with HDR, a 4K Ultra HD TV with HDR, an Ultra HD Blu-ray player and a high-speed HDMI (category 2) cable are required. All eight Harry Potter films on Ultra HD Blu-ray feature DTS:X audio, which replicates and conveys the fluid movement of sound to create a richer experience than previously possible by moving sound to precisely where the mixer placed it. A hallmark of DTS:X immersive audio technology is its ability to adapt to the speaker layout to best fit the individual viewing space by seamlessly transporting sound to and through specific locations within the viewing environment – in front of, behind, above and beside the audience.